An installation for the MIT Infinite Corridor, 77 Mass Avenue, Cambridge MA. 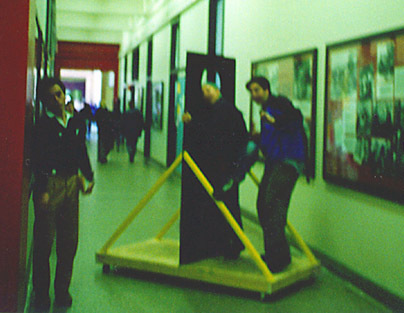 The Infinite Vehicle was installed in the MIT Infinite Corridor for five days during the Fall of 1997. The goal was to create a mobile social space for the extremely long and busy main corridor of MIT. The students of MIT traverse the corridor at great speed many times a day. We hoped to create a vehicle that would encourage students to stop and communicate with each other while still allowing them to traverse the corridor. The vehicle consisted of a platform mounted on wheels. A black wall was situated in the middle of the platform with a hole carved out to allow communication between two riders. This created a moveable wall in the infinite corridor. The wheels were lose enough to allow riders to swing the vehicle around while mounted on it, or to push it along like a skateboard. The installation was used and played with by a variety of bewildered MIT students during its five day tenure.